Pictured (L to R): Samuel Gideon Pillow, Daisy (Butler) Brockwell. Setting/Location: Outdoors, unknown location. Most likely on or near Samuel’s property near the Old Antioch Baptist Church site on Vaughn Road, North of Paris. Date: Circa early 1940s, judging by their age. 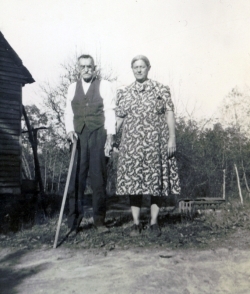 Sam and Daisy both lost their first spouses in the 1920s. They later married, probably more out of necessity than anything else. Sam suffered a broken neck at some point in his later years which kept him very much bedridden. He passed in 1945 and is buried near his first wife, Margaret Ellen (McFarland) Pillow at the Old Antioch Baptist Church cemetery. Daisy passed in 1950 and is buried next to her first husband, William Robert Brockwell, at Point Pleasant Baptist Church cemetery near Paris Landing. This was written by Curtis. Posted on Wednesday, October 21, 2009, at 12:49 pm. Filed under 1940s, Brockwell, Butler, McFarland, Pillow. Bookmark the permalink. Follow comments here with the RSS feed. Post a comment or leave a trackback.